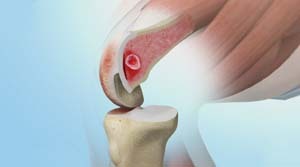 Bone marrow lesions or BMLs are strong predictors of osteoarthritic cartilage damage. Bone marrow lesions are visible on an MRI but not in a regular X-ray. BMLs are sites of chronic inflammation of subchondral bone. They lie below the bone surface within the marrow and are accompanied by swelling and fluid collection (oedema). BMLs are associated with subchondral defects, insufficiency fractures and stress fractures. Conservative treatments for BMLs include pain medications, knee braces, crutches, and Vitamin D and Calcium. However, long lasting (chronic) BMLs that do not heal by themselves will require treatment. Patients with chronic BMLs have faster cartilage destruction and are more likely to require a total knee replacement, earlier. Biplanar fluoroscopy allows the surgeon to target the internal subchondral location of BML from a range of trajectories. A pin is inserted through the skin to the bone under fluoroscopic imaging.